The first time I gazed at the sky in fascination was on a clear night on an off-road trip in Hingol, Balochistan. I had never seen a sky so full of stars and stood awe struck at the beauty and magnificence of the heavens. Naturally, my next impulse was to buy a telescope powerful enough to see them up close. I found this to be a very costly venture as telescopes, especially good ones are expensive. So I proceeded to scrounge for details on how to build one on the Internet. When I discovered that building one requires an array of optics not easily found and of considerable expense, I gave up this pursuit as well. There are people though, who do not have access to half the resources I do in Pakistan who do not give up. Asad Mehmood is one such guy. He hails from Okara and at the age of 18 he built the 6th largest telescope in Pakistan. This guy is super cool – here’s The Express Tribune magazine story on him. I caught up with him at a local event to ask him just that! 1) What inspired you to make a telescope? Were you always a stargazer? I was initially inspired by my glasses and, one day, my father gave me toy binoculars for acquiring the first position in 5th grade. This enhanced my curiosity towards optics. I detached all its components to discover how it worked. That was the beginning of my experimentations with optics. With every new discovery, my enthusiasm and curiosity for optics increased. By high school I felt like a master of optics because I had learnt so much and became fluent with different lenses. I used to conduct experiments at home in my room and had managed to collect more than 60 lenses. I had also never seen a microscope in my life. Fortunately, I was able to build a powerful microscope that was a result of my experiments. The cost spent to build that microscope was only Rs500 but its image quality was similar to one that costs Rs.30, 000. It’s power was 300x. The materials I used were very cheap and I was very happy with my success. In the 10th grade, an Astronomy team from Lahore, along with Sir Ali Khan and Umair Asim visited our school. Umair Asim had built Pakistan’s 3rd largest telescope having a 14” mirror diameter. They showed us direct sights of moon and several planets. That was the first time in my life that I saw a real telescope. At this point, I determined to build my own telescope similar to it. The telescope required a reflective parabolic mirror (instead of lenses) and so I had to grind my own parabolic mirror to make the telescope. I had built “refracting” telescopes so far but this time around, I had to build a “reflecting” telescope. I bought a pair of 8” diameter and 19mm thick round glass blanks from the Lahore glass markets and ground them into convex and concave plates. After the grinding was finished, with very fine and smooth curves in both glass blanks, I accidently broke one of the blanks. But I didn’t lose hope and bought another pair of 6” diameter circular glass blanks and ground them. After the grinding, I had to polish the glass; which was tougher and trickier. After a few months, I had my mirror coated with aluminum from Dr. Zafar Iqbal in Islamabad. He aluminized my mirror in a coating chamber and my mirror was ready. I built the whole body of the telescope including its stand, rocker box, up-down and left-right movements, finally assembling it and bringing the telescope in working condition. At last, after working 8 months constantly, I was able to increase the magnification and enhance the inverted image of a cheap Galilean design telescope. This telescope could show magnified craters on the moon, but the magnification and clarity was limited – blurring the image due to chromatic aberration and spherical aberration of lens was now the hurdle in my way. So I started performing experiments in decreasing chromatic and spherical aberrations of a convex lens. I used to fill oil, water, and many other transparent liquids in two convex lenses, that reduced both aberrations to some extent but I was still not satisfied. I wanted to do something very big. To some extent, I was a stargazer initially but what I wanted was to see sky objects through my own handmade telescopes. I had never dealt with telescopes or any other similar objects, but I was confident that I would be able to make my own handmade telescope! 2) Were you sponsored by someone to enable you to make this telescope? No one sponsored my project, I worked with my own resources. I used to buy lenses from the optical stores with my pocket money. Later on, when I started the larger project of making a reflecting telescope, in my 1st year of F.Sc, my father supported me financially; enabling me to buy grits (grinding compounds) and mirror blanks. At the end of my 1st year my father was diagnosed with an ailment, which resulted in a stroke, after which I started giving tuition’s to support my family as well as finance the expenses of my project. Despite the hurdles and hardships I suffered through this time, I continued doing my work. 3) What was the biggest hurdle you met during the manufacturing process? The biggest hurdle I faced during the making of my project was financial support. I had to earn myself because my father had retired from his job due to his health. It was very difficult for me to study, give tuitions and continue my project at the same time. I worked day and night constantly from September 2009 to January 2011. And at last, my 6” Newtonian design reflecting telescope project was finally complete on the 10th of January 2011 (on my birthday). 4) Has anyone other than ”Mera passion Pakistan” recognized your achievement? Who do you consider your mentor? Sir Ali Khan, a scientist from Lahore, encouraged me throughout my telescope manufacturing period. 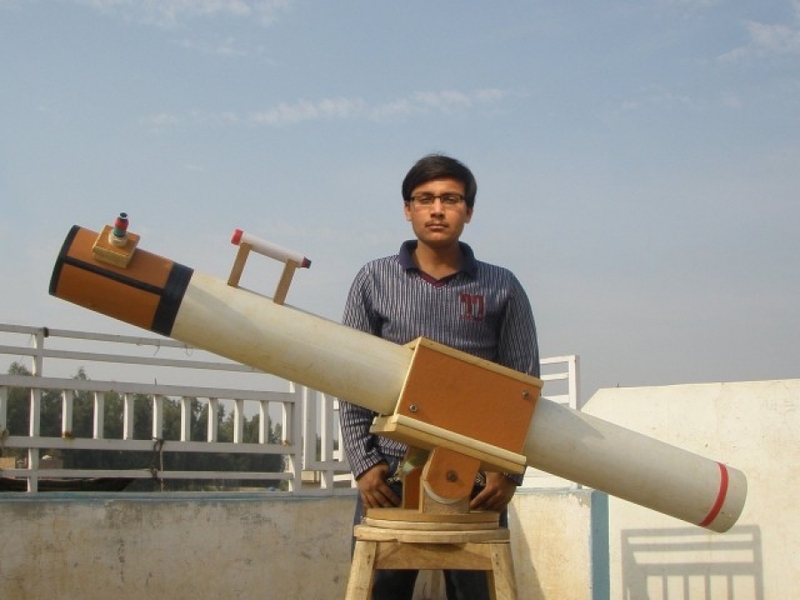 He was the only person who showed me how to build my own telescope in Pakistan. He helped me search glass markets and other machinery stores of Lahore and found grits as well as glass blanks and other components for this project. 5) You accomplished something you dreamt off, would you like to give a message to other dreamers in Pakistan? I dreamt of my own reflecting telescope. My dream was to explore the sky through my hand made telescope; and by the blessings of Allah, I succeeded in converting my dream into reality. I just worked very hard and as a result, God gifted me this success as a reward. I just want to tell the youngsters of Pakistan to think positive thoughts, do positive deeds and get positive results. Hard work never goes fruitless. Never give up for that is not who we are!